Being a vegetarian gives us great power – power over improving environmental health, animal welfare and human health. But with great power comes great responsibility (you saw that coming from a mile away, right?). Even as a dietitian, I can find it truly challenging to obtain enough of certain vitamins and minerals if I’m not vigilant, specifically iron. Though I do make generally healthy eating choices, I must admit it’s happened that I have been careless about iron and ended up with anemia (seeing stars, feeling fatigued and dizzy – basically feeling like an all-around zombie). Iron is important for carrying oxygen to all parts of your body and comes in two forms: “heme” and “non-heme”. “Heme” iron comes from animal sources such as fish, poultry and meat. “Non-heme” iron is obtained from plant sources such as legumes (lentils, soybeans, chickpeas, beans), tofu, tempeh, fruits, vegetables and grains. Iron from vegetarian diets is only 10% absorbed, as compared to 18% when an omnivorous diet is consumed. High consumption of caffeine (especially at meal times), this includes coffee, tea, energy drinks and chocolate. High levels of physical activity can increase your need for iron. Heavy blood loss (i.e. menstruation). Calcium and iron compete for absorption when both found in your intestines and therefore if you consume your iron-rich foods at the same time as calcium-rich foods, iron absorption will be decreased. Vitamin-C is an “iron absorption enhancer” (yup, that’s a thing!). Pairing iron-rich foods with vitamin-C sources (such as oranges, kiwis, strawberries, red peppers, etc.) can improve iron absorption five-fold. Consuming coffee or tea between meals. Having low iron levels. Not that this is something you should strive for. However, know that if your iron levels are low, your body will work hard to better absorb any iron you consume. 🙂 Thanks body! Cooking with a cast-iron skillet can slightly increase iron content of food. If you suspect you are iron-deficient, do not self-diagnose, as taking iron supplements if you do not have a deficiency will not improve your symptoms. Plus, excess iron may be toxic. Blackstrap molasses: 3.6 mg per 1 tbsp. 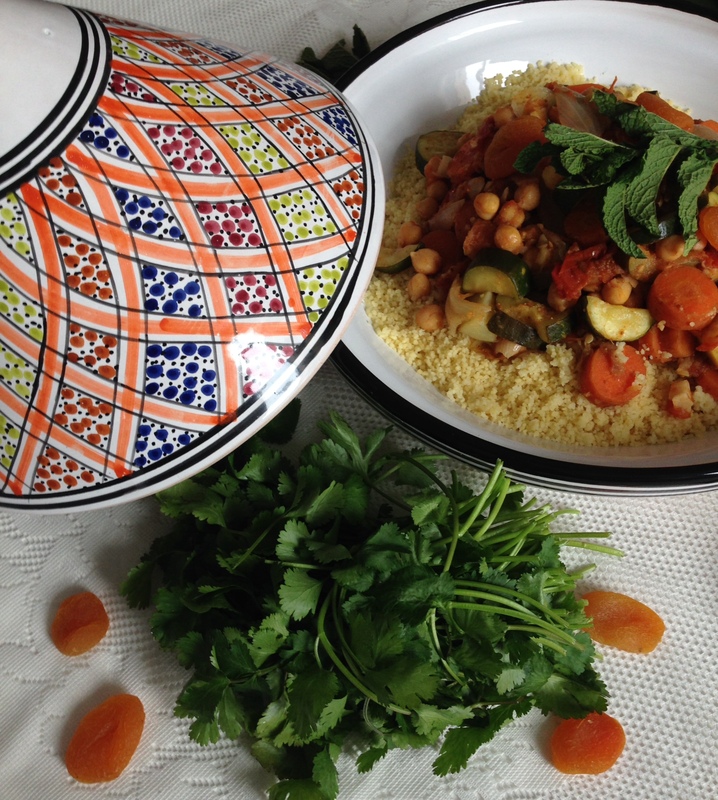 Tajines are super healthy and exotic meals that are popular amongst many North African tribes. They are named after the clay cooking vessel they are prepared and served in. I love this type of meal because when concocting one, so many vegetables are fair play: cauliflower, pumpkin, courgette, squash, onion, tomato, carrot, celery, fennel, eggplant, green beans, sweet potato and the list goes on! This particular one contains a few of the aforementioned sources of iron (chickpeas, dried apricots and potatoes) to make your red blood cells happy. To call a tajine successful in my books, the vegetables contained should be shapely and tender, yet not “hospital-food” soggy. Also, good tajines will traditionally call for signature spices like cinnamon, cumin and coriander, which not only add exciting flavour but also pack an antioxidant punch. 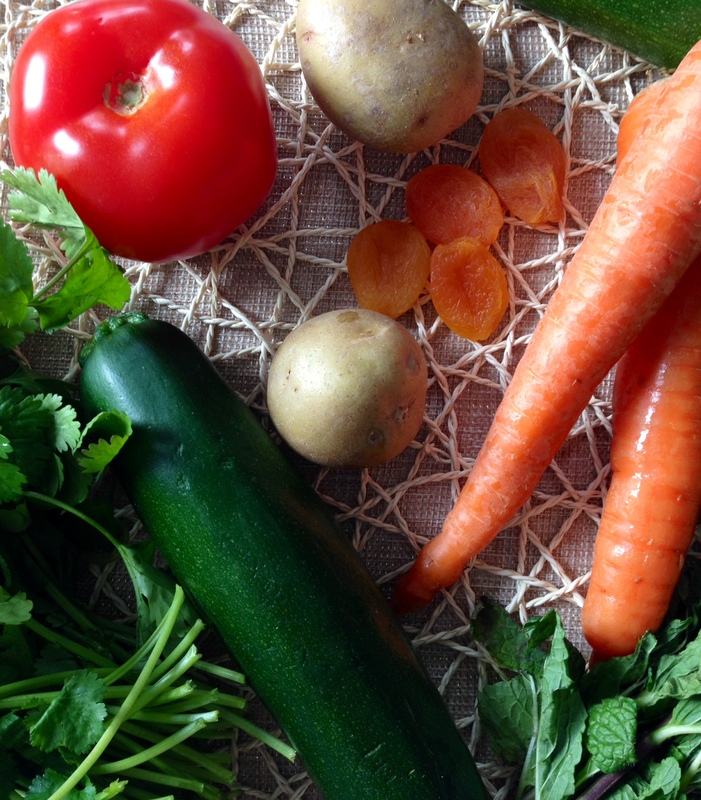 In a medium-sized pot, bring water to a boil and add carrots and potatoes. Cook until tender. In a medium to large pan, add 2 tbsp. olive oil, onion, ginger, garlic, tomatoes, courgettes and dried fruits and sautée until onions are translucent and courgettes are soft. Adding the dried fruits at this point rehydrates the fruits and renders them a bit more plump. If you’d prefer, you can hold on to them and add them at the very end, for dryer fruit. In a large pot, add the couscous and vegetable broth, along with the ras-el-hanout spice mix, salt and pepper. 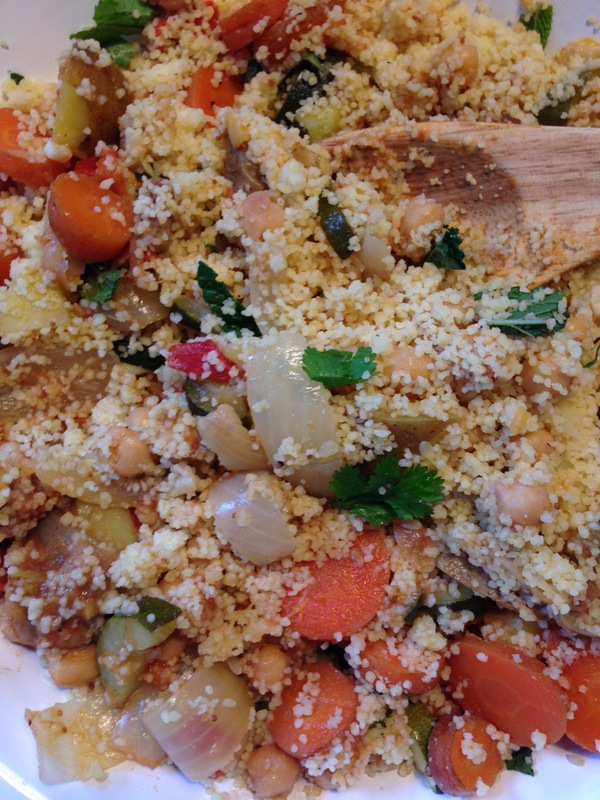 Cook until couscous is well-cooked (allow couscous to absorb liquid for 5-8 minutes). Fluff couscous with a fork. Stir in the extra tablespoon of olive oil and honey and top with fresh coriander and mint. Adjust all seasonings to your liking. 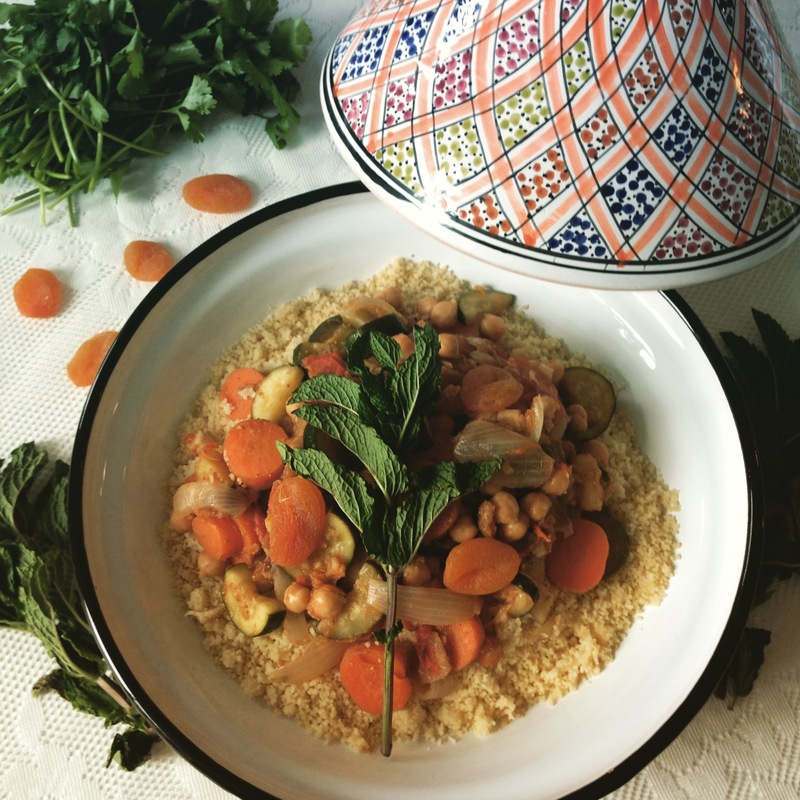 Serve in a tajine (obviously optional). Give your stomach a meal it will be thankful for. Previous Post Got the Seasonal Blues?